The October 2014 Mussel of the Month is Triplodon corrugatus. Triplodon is a genus of two species, distributed from northern South America through the Amazon basin. MNHN. Brazil. Voyage M. Francis de Castelneau & Emile Deville! Triplodon corrugatus is one of more than 70 species known from the region of northern South America, including the Amazon basin. 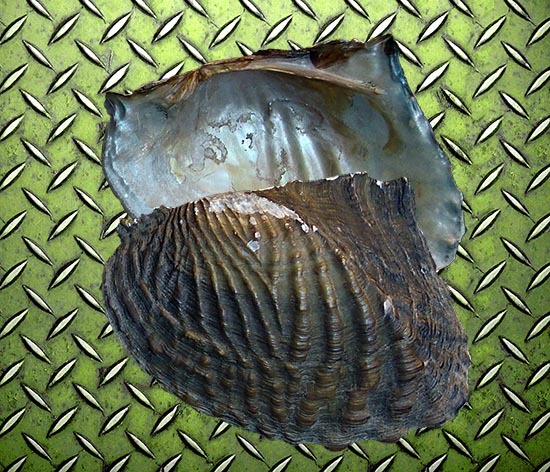 Recently, KSC gave a presentation on the subject at the 7th Malacological Congress of the European Malacological Societies entitled, "The Freshwater Mussels (Bivalvia: Unionoida) of Northern South America and the Amazon." He discussed our systematic re-evaluation of the taxa of the region based on 1) fieldwork conducted by KSC in collaboration with Christine A. Mayer (1986-1995), 2) our collections-based study of specimens in 17 major research collections, and 3) a comprehensive literature review. The 71 species of the region are classified in 16 genera and 3 families: Hyriidae (29 spp. ), Mycetopodidae (40), and Etheriidae (2). Thirty-nine species are found in northern South America, 19 of which are thought to be endemics. Forty-four species are recognized from the Amazon Basin — 14 of which are endemics (46 & 19 including the Rio Tocantins). The genus Triplodon is known only from a few drainages in Northern South America and the Amazon (including the Tocantins) with the exception of a disjunct population located near Victoria in the state of Espirito Santo, Brazil collected as part of the Thayer Expedition to Brazil conducted by the MCZ. * 71 species according to us. Only 5 of these await description. Cummings, K.S. & C.A. Mayer. The Freshwater Mussels (Bivalvia: Etherioidea) of Venezuela. Martinez, E.R., M.A. Cabrera & C.A. Lasso. 2004. Moluscos bivalvos (Unionacea y Mutelacea) de la cuenca del río Orinoco, Venezuela. Memoria de la Fundación La Salle de Ciencias Naturales 159-160: 283-303.